Risotto was one of the first “adult” recipes I ever attempted during my university years, back when even grilled cheese seemed ambitious. It’s not difficult to make by any means – in fact far from it – but it isn’t quick either. It requires constant stirring for a good 30 minutes, so if you plan to entertain your dinner guests with involved conversation, shadow puppets or pre-dinner juggling perhaps you should stick to rice or roasted potatoes as a side dish instead. I personally think it’s worth it and haven’t come across anyone yet who has passed up a plate of warm risotto topped with fresh Parmigiano Reggiano. I had never even heard of risotto until being invited to a Slow Food experience at a friend’s house a few years ago. I’ve been known to eat like a prison inmate, purposefully focused on my food and quickly devouring, so I had my reservations about how I would cope with slow food. Unlike my misconceptions, slow food didn’t actually involve chewing each morsel for twenty minutes; but rather, sampling different dishes in different rooms over the course of five hours and pairing each dish with a glass of wine or aperitif. Or at least that was my friend’s take on it. For Christmas one year I received a stacker cooking kit. It looks like a device that should have included Play Dough, though it is meant for food. It’s perfect for stacking veggies, rice – or in this case risotto – into shapes, and for layering various food like geological strata on the plate. 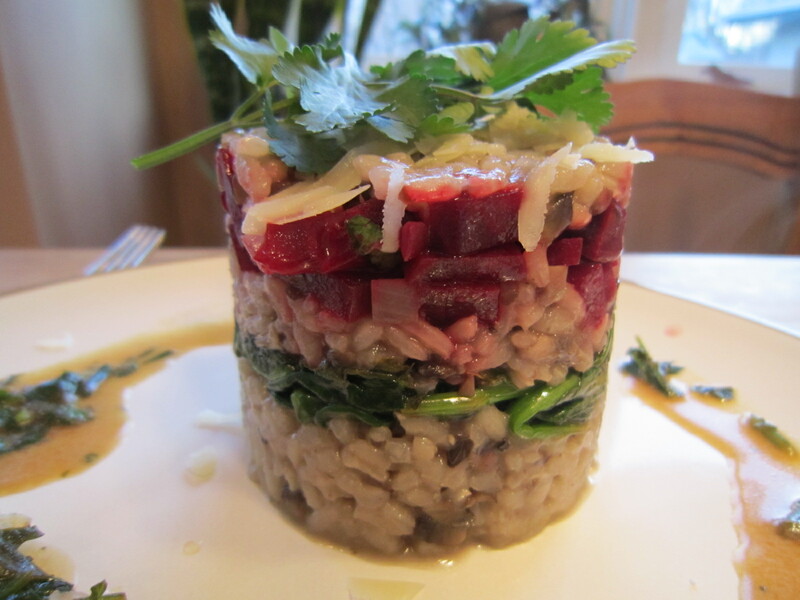 I had some spinach and beets in my fridge so thought these would be good test subjects for stacking with the risotto. The result: a tasty and colourful tower of Italian delight. Enjoy!